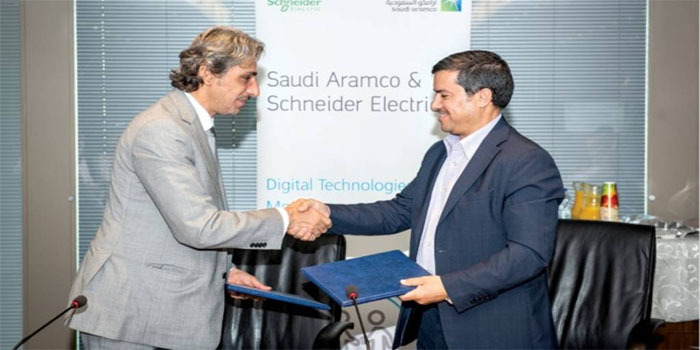 The Saudi Arabian oil Co, known globally as Saudi Aramco, on Thursday announced signing a memorandum of understanding (MoU) with Schneider Electric Saudi Arabia in a bid to boost cooperation in various sectors related to Fourth Industrial Revolution solutions. The deal covers a range of fields, namely oil and gas, integrated manufacturing operations management, raising research outcomes, power management systems, the Industrial Internet of Things (IOT), according to the world’s largest oil producer’s statement. This agreement will bolster Schneider Electric’s investments in the oil-rich kingdom. The move is also part of the GCC nation’s “Vision 2030” reform plan, intended to diversify the kingdom’s economy and invest more heavily in infrastructure.